Kauai land for sale has offerings that are truly unlike any other place on the planet. Rich vegetation, beach front property, and picturesque views are only some of the features these properties will provide you with. This land is just waiting for your personal touches to make it your own. Purchasing property on Kauai will give you the freedom to build the home you've always dreamt about. Whether you're searching for a large acreage or a small lot, you'll be pleased to know you're investing in a lucrative asset. If you're searching for a property with panoramic ocean views, you should consider property in Hanalei and Koloa. These beachfront parcels offer unique opportunities to own oceanfront acreage that you can only dream about. Or if you're looking for a secluded mountain view estate, you'll love Wailua Homesteads or Kapahi. Whether you prefer mountain views, valley views, ocean views or all three, you'll love the selection of Kauai land for sale. These properties offer beautiful topographical features and give buyers the opportunity to build a private estate on the Garden Isle. These properties are lucrative assets and rarely stay on the market for very long. So, be sure you are ready to buy as falling in love with the land is a given! Prior to purchasing the land be sure you know what the land can be use for. There may be restrictions for developing subdivisions in certain areas, as well as issues if you want to build on agricultural land, which is currently zoned for 1 home for every 3 acres of land. There are Gentlemen Farms where larger homes are constructed on 2-5 acres of land that have marginal agricultural activity. If you are purchasing land and building on it, be sure to use a local Kauai architect as it will save you money in the long run. They know many of the additional permits and approvals needed such as grading permits and many more. Keep in mind that once all your plans for building have been submitted to the local building department in Kauai, the permits may take 2-4 months to process and approve. Kauai was once one of the most expensive islands to buy land on, but in recent years prices have become more and more affordable. It is still one of the most sought after areas in Hawaii given the rich soil and lush landscaping. When you are ready to purchase land, make sure you are familiar with the zoning and by laws in the area so that your plans for development go as quickly and smoothly as possible. Kauai acreages for sale can be found on parcels close to the water on the eastern side of the island. Areas of land around Princeville and down the coast to Wailua seem to be the most popular area for large plots of land. 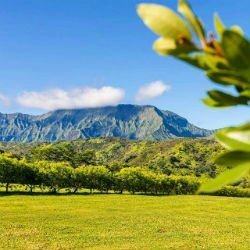 This being said, the Koloa area has acres of green space that is prime for developing and close to the amenities of Lihue. There is no surprise when it comes to pricing of lots for sale. The better the view the higher the price and the closer to the ocean the more you'll pay. As an example, if you compare a ¼ acre lot in Kapaa just off of Papaloa road offering you ocean front living, to a gorgeous lush hillside acreage with 24 acres in Kaumualii, you'll find they are priced the same. When considering a lot for sale, be sure you look around the island to find exactly what you want out of the property. The ocean front is a dream for so many, but keep in mind that secluded hillside oasis to be sure you have considered all your options. For more affordable Kauai lots for sale, focus your attention towards the southern end of the island. This area is seeing a lot more development over the years and has excellent amenities. You can find ¼ acre lots within established housing developments as well as a few acres of grassland a bit further back from the water. Even if you are looking for a retreat with acres of land surrounding you and the only sound you can hear is the ocean gently lapping the shoreline, you'll still want to know where you can shop and dine in this fabulous part of the world. The northern end of the island is a fantastic resort area with many hotels and restaurants and amazing beaches. You can find artisan shops and discover exceptional places for casual or fine dining. As for the southern tip of the island, you'll find more commercial offerings along with the island's airport in Lihue. Regardless of where you decide to purchase a property, you'll have many options just waiting for you in your new life in this incredible natural setting. Let Anne Eliason help you achieve all of your real estate goals. Simply send her a message online or call her directly at 808-855-5808.